By Dan Ambrose: Undefeated IBF light heavyweight champion Tavoris Cloud (24-0, 19 KO’s) got more than what he bargained for last Saturday night in beating #3 IBF ranked contender Gabriel Campillo (21-4-1, 8 KO’s) by a somewhat controversial 12 round split decision at the American Bank Center, Corpus Christi, Texas. The judges scored it 115-111 for Campillo, 116-110 and 114-112 for Cloud. I had Cloud winning by a 116-110 margin as well. 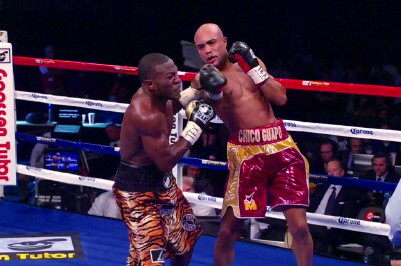 Campillo was knocked down twice in the 1st round and came back to win a lot of rounds, but he faded badly in the 11th and 12th rounds and let the fight slip away. Cloud seemed bothered by Campillo’s workrate and southpaw stance, because he was hit quite a bit by him and problems until Cloud stopped throwing as many punches late in the fight. I think Cloud is kidding himself here. He was having problems against Campillo long before he was cut in the 4th round. Cloud started having difficulties with Campillo starting in the 2nd round when the Spaniard started opening up with his combination punching, catching Cloud frequently with hard uppercuts. Cloud is just lucky that Campillo didn’t have a lot of power and let off frequently. It seemed like each time Campillo would open up with a salvo of punches, Cloud would stop throwing shots and just back off. A bigger puncher and/or a someone that won’t stop throwing shots would give Cloud a really tough time. He’s quite lucky that Campillo wasn’t that fighter because I think Cloud would have lost. As it is, Cloud seems very vulnerable and not someone that will hold down the IBF belt for a long period of time. I can see Cloud losing to Chad Dawson and Ismayl Sillakh if he ever faces those guys.